The basilisk is a lizardlike creature with six stout legs; they are very heavily built, and are quite slow-moving in cold weather. It is fairly common for basilisks to have more than one pair of eyes. A basilisk is known for its terrible gaze - when one wills it upon another, the sight of their eyes is able to turn their victims into solid stone. Location Found:: abroad in mountainous regions. Cold Mercy While most won't involve themselves to any great extent in the affair of other races, a basilisk that has come to care for another can sometimes be convinced to spare them from a painful death by turning them into stone, thus ending their misery. This is most commonly done if the dying person is sick, poisoned, or otherwise dying in some excruciatingly painful manner. Due to how much energy this costs the basilisk, it is almost unheard of for one who is not a close friend of the dying to grant such an end. Stone Gaze The gaze of a basilisk is only fatal after a handful of hours; for a time, the stone will not be solid, and the victim may be saved. However, once the process has reached the vital organs, it cannot be reversed - and the individual will die. Together In Death When a pairbond reaches the point where one or both begin to show signs of nearing death, an especially close pair might decide to gaze into each other's eyes, and simultaneously unleash their stone gaze upon one another. This ensures their souls will enter the afterlife together, and that neither will have to live without the other. Species info credited to Skyeh, Fyfergrund, and Blazeh/Verridith. Appearance The basilisk appears to be a very large lizard with crocodilian aspects; their faces are elongated and may have visible teeth. They have six legs, the back four powerful hind legs, and the front pair somewhat more slender forelegs. They use all six of these legs for walking, as their feet are generally ill-suited for grasping objects. Basilisk scales are dull and lusterless, with minimal markings; most commonly, they may be found with green, brown, and black tones, though any color is possible. Each leg is tipped with finely honed claws; the hind legs are equipped with broader, larger talons, while the forelegs' talons tend to be narrower, longer, and serrated on the inside edge. The basilisk's tail is flexible and generally the length of their body, tipped with spikes. Their heads are graceful and short-snouted, with or without horns or frills and a basilisk's eyes are always a deep shade of amber-gold, with snake-slitted pupils. 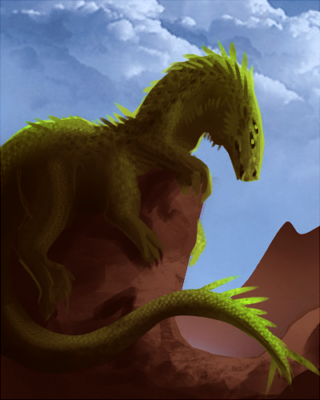 In size, a basilisk can range from being the height of a human to the size of a large hill; they never stop growing, though their growth is substantially slower than that of a dragon's beyond hatchling age. Culture Basilisks are just as intelligent as dragons, and a peaceable race - they prefer to stand on the sidelines and remain neutral of most conflict, and many will not attack until sorely provoked. It is common for a basilisk to be permitted to pass through the territory of a lion pride or wolf pack without issue, as it is generally not worth the trouble for them to try to fight a basilisk that doesn't intend to settle in their lands. It is common custom for a basilisk making such a journey not to hunt until they pass out of the pack or pride's hunting grounds. This race is solitary, and usually only live in mated pairbonds which last for life. However, it isn't uncommon for basilisks to at least remain aware of the presence of any others of their kind living nearby. Broods have no more than a single egg at a time, and mating season comes once every five years in Kelvar, where females will actively seek nesting sites and a mate, should she have no pairbond. The egg takes half a month to hatch, during which time the mother and father take turns hunting and guarding the egg. The hatchling emerges from the egg fully scaled but blind; sight comes in two weeks. After a month, the hatchling is able to survive on its own, and is driven from the nest. The young basilisk takes three years to mature and can then mate by the next breeding cycle. Prey includes anything from small deer to large carnivores. Abilities The talons, tail-spikes, and fangs of a basilisk are their primary weapons; however, males possess a mild neurotoxin that immobilizes the victim in thumblike barbs on both foretalons as an added defense. Basilisks are swift runners due to their six legs, and powerful jumpers with their four strong hind legs. Many can use magic, but have very little success learning anything but earth, light, and dark elements. A basilisk hunting large prey or fighting a large opponent will occasionally sink their teeth into their foe, lock their jaws, and wait for their victim to wear themselves out trying to escape. While they are strong in magic or talon-to-talon combat, the basilisk's weapon of last resort is the infamous stone gaze. One may look deep into a basilisk's golden eyes without harm, but if the individual wishes it, the slightest peek at their eyes will petrify the victim into a stone statue; against larger foes and with younger basilisks, the stone may only affect a portion of one's body. However, this ability taxes the basilisk's strength, and few of this race will use the power without good reason. Older basilisks may reverse this in the first few hours to save that victim; other magic may do similar things, but not without some skill. After watching a particularly large lizard ambush an auroch and kill it, Death was intrigued. He had at first dismissed it as being too slow to suit much of a purpose for him, but the speed with which it struck from ambush drew his attention. As it ate, ripping chunks of flesh from the dead auroch, the dark god pondered what to do with it. By the time it had eaten its fill, he had a plan, and the torpid reptile could barely try to resist as Death seized it and began to work his influence upon it. 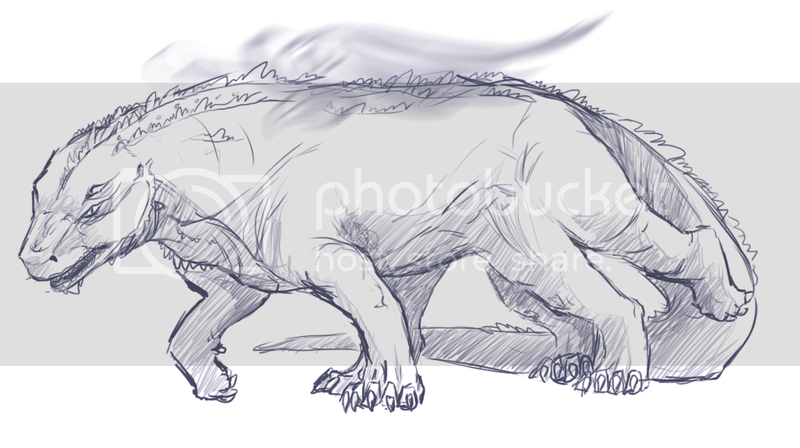 He gave it an extra pair of hind legs to give it greater speed and jumping power, sharp talons capable of rending flesh, a long, whiplike tail tipped with sharp spikes, three sharp horns on its head, two above its eyes, and one on the tip of its nose. To its foretalons he added a paralyzing neurotoxin. As it stared at him reproachfully, seemingly too dull of mind, and too torpid from its meal, to feel fear, his fangs bared in a malicious grin as he had an idea. He instilled a potent magic into its gaze, rendering it capable of turning lesser beings into solid stone. Then, satisfied, he awakened its mind, and set it loose. Although the first basilisk lacked any real sense of malice, he was nonetheless aggressively protective of his territory, and proved to be a deadly fighter, capable of moving far faster than his size and build suggested. Death, pleased with his new creation, created more basilisks, and scattered them across the First Realm to sow further chaos. This Ancient First was a basilisk that looked like multi-legged lizard with bright scarlet scales marked in iridescent blue; his eyes were the color of smoldering coals. He was an irritable and territorial individual, and had the ability to freeze any being into stone with his gaze.